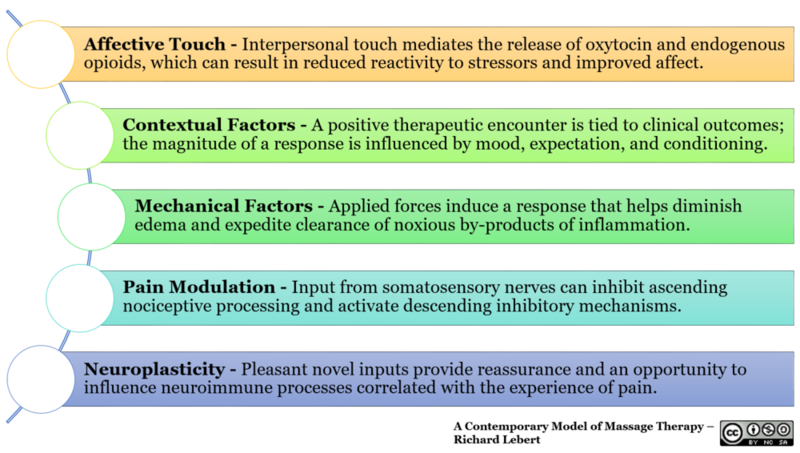 In a contemporary model the beneficial effects of massage therapy are best described as a collection of interconnected adaptive responses. Ji RR, Chamessian A, Zhang YQ. Pain regulation by non-neuronal cells and inflammation. Science. 2016 Nov 4;354(6312):572-577. Lehman GJ. The Role and Value of Symptom-Modification Approaches in Musculoskeletal Practice. J Orthop Sports Phys Ther. 2018 Jun;48(6):430-435. Malfliet A, Kregel J, Coppieters I, De Pauw R, Meeus M, Roussel N, Cagnie B, Danneels L, Nijs J. Effect of Pain Neuroscience Education Combined With Cognition-Targeted Motor Control Training on Chronic Spinal Pain: A Randomized Clinical Trial. JAMA Neurol. 2018 Apr 16. Wallwork SB, Bellan V, Catley MJ, Moseley GL. Neural representations and the cortical body matrix: implications for sports medicine and future directions. Br J Sports Med. 2016 Aug;50(16):990-6.